Socrates Sculpture Park, located at 32-01 Vernon Boulevard, spans five acres (about the size of one New York City block) on the East River waterfront in Long Island City, Queens. The beach at Hallets Cove, is also under the Park’s purview and is accessible via the beach gate at 31-10 Vernon Boulevard. You can access the Park at either the Main Gate, located at the intersection of Vernon Boulevard and Broadway, or the North Gate on Vernon Boulevard between 31st Drive and 31st Avenue. The gates are opened every morning at 9AM and closed every evening at sundown (with the exception of certain programs or events). Admission is FREE and visitors are welcome to enter and exit the Park at their leisure during our open hours. Dogs are welcome in the Park, but must be kept on leash at all times. Visitors found in violation of this regulation will be fined by the New York City Parks department. Please no alcohol or barbecuing. Picnicking is allowed, but parties or large social gatherings are not permitted. There is no parking at Socrates with the exception of one handicap-accessible space outside the main gate. Free street parking is available in the surrounding neighborhood. 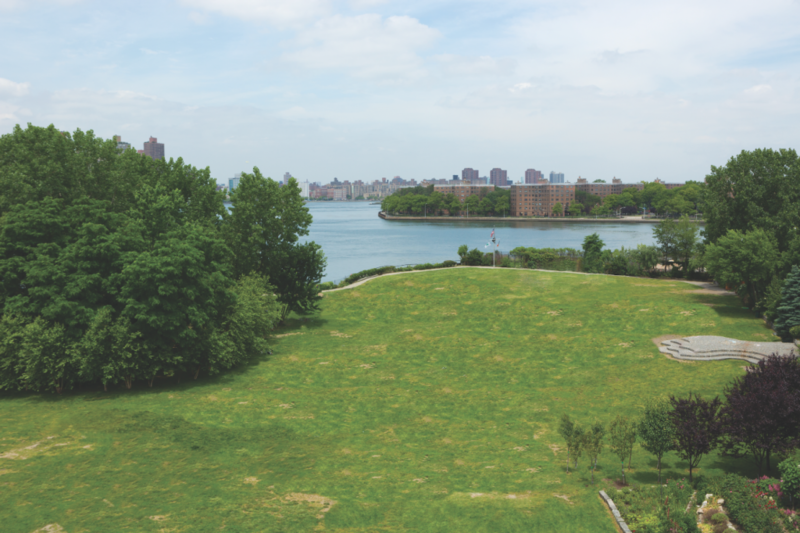 –The outdoor artist studio at the southern edge of the Park is off-limits to the public. –The education area, Sticks, is off-limits when not in use for a designated program. –The Park’s decorative gardens and rocky shorelines are off-limits. There is an info box with interpretative materials about the Park’s exhibitions and programs attached to the Main Gate at the intersection of Vernon Boulevard and Broadway. Porta-johns are available from April-November and are located at the southern end of the Park. There are no public restrooms at Socrates from December-March. A water-fountain is located inside the Main Gate of the Park at the intersection of Vernon Boulevard and Broadway. Public benches are spaced at intervals around the Park’s perimeter. A cobblestone path runs around the perimeter of the Park. The path is wheelchair accessible. The Park provides free doggy bags in a dispenser located inside our main gate at Vernon Boulevard and Broadway. A raised cobblestone platform is located at the north-eastern edge of the Park. During the height of our annual programmatic season from April-August, we also install a wooden stage in the grove of trees. Socrates Sculpture Park is free and fully accessible to visitors of all abilities, including but not limited to individuals with physical, visual, and auditory disabilities, owners of special care animals, and wheelchair users. – There are no steps or stairs within the five-acre landscape, and there is a wheelchair accessible paved pathway around the perimeter. – There is a handicap designated parking space at the Main Gate of the Park at Vernon Blvd and Broadway), which accesses the paved pathway. – Temporary, portable bathrooms are provided seasonally from late April to October, including one ADA/wheelchair accessible portable bathroom. – For our hearing impaired guests, we offer assisted listening devices for amplified programs at the Park. Please call 718-956-1819 in advance to arrange a device. -At certain events, the Park utilizes wheelchair accessible mobi-mats on the grassy lawn. Please call 718-956-1819 to inquire about specific events. If you believe you may have lost something at the Park please email info@socratessculpturepark.org or call 718-956-1819.